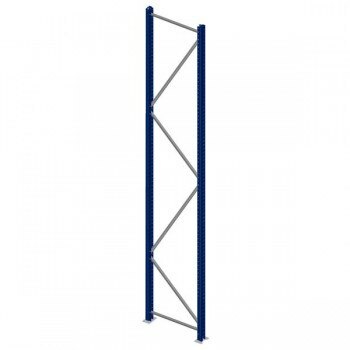 Bulk rack frames are the vertical elements of the bulk rack system. They are rectangular in shape and come in a variety of heights and depths depending on the needs of the customer. 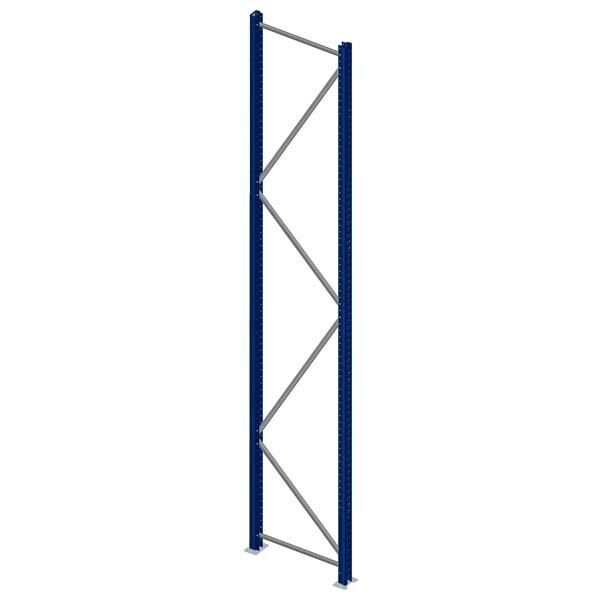 A bulk rack span frame consists of two posts connected by a series of diagonal struts and includes two heavy-duty foot plates that are bolted to the bottom of each post. These posts are made of 16 gauge steel. Spacing of the diagonals is determined by the height of the frame. Bulk rack systems connect via bolted components. In addition, two sets of circle punches are on the sides of the columns to allow for accessories to attach. These holes are all evenly spaced 2” apart. Bulk rack frames are painted standard Mecalux Blue using a cataphoretic paint process and arrive assembled upon shipment.